Facebook is the highly used social networking app and website. People use it not only to stay connected with friends and family but to compete with friends and play online games. You must have come across at least one or many game requests from your contacts in your Facebook account. These requests are either asking you to join your friends or to give them a life so that they can continue playing the game. To do any of the said things, you need to download the game. Once you do that your Facebook account will automatically be linked stating that it is done to save your game progress. There are different apps and games which lure you by stating that you can get extra cash to play game, life, and hint to stay ahead but for that you need to first login to Facebook. This is just the beginning, to guarantee continuous usage of the game with saving user progress on game, developers selected Facebook as a medium to “auto-register” users. By connecting app and game accounts to Facebook, users can resume their game from the same stage where they left from any device. They just need to login to their account and will be able to access the app and game from anywhere. Does all this sounds like a problem, for most of us it is a good thing as it saves time and gives you easy access. But the problem occurs when you want to free your Facebook account, from such apps. Why to delete an app or game from Facebook account? There are several reasons why users want to remove an linked app or game with their Facebook account. * No longer use the app or game. * The linked app or game is too intrusive, and you don’t want to receive the invites or timeline posts. * Want to start the game or app afresh. * Due to linking device has become slow and is conflicting between devices, apps, and Facebook account. Firstly, log in to your Facebook account to which the app or game is linked. 2. Once you are logged in, click More Options button present on the upper-left corner of the screen. 4. Click on the Apps option. 5. Now, click on the Show All to view all the linked apps. Don’t be surprise to see the number of apps linked with your account. As many times you don’t even realize that permission is been granted to an app or game. 6. Scroll down the list to select the app or game that you want to delete. Since, apps are sorted alphabetically you can easily locate them. 7. Now hover your mouse on the app icon you wish to remove. You will see 2 buttons Edit and Close. In case you are unable to see these buttons keep on hovering the mouse until you see them. Click on the Close button to delete and unbind the selected game or app from Facebook. You will then see a confirmation box, click on Remove button to unlink the selected app or game. The app will then be successfully removed from your Facebook account. The app is now successfully unchained and removed. 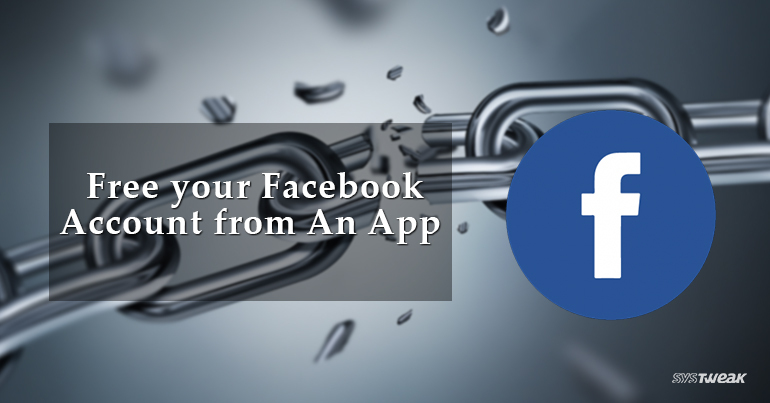 Now you know how to unlink an app or game from your Facebook account. It is not that tough as you think it will be. You just need to be aware while granting permission to any app or game. This feature indeed makes the app usage easy but sometimes it is annoying also. So if you no longer want to receive any updates and notifications for any app or game follow these simple steps.